Hackney residents and businesses are now taking steps beyond recycling to contribute to a greener borough. Small-scale renewable energy projects are becoming more common, largely due to the national feed-in-tariffs announced in April last year, incentivising families, small businesses, schools and hospitals to install solar photovoltaic (PV) panels on their properties. 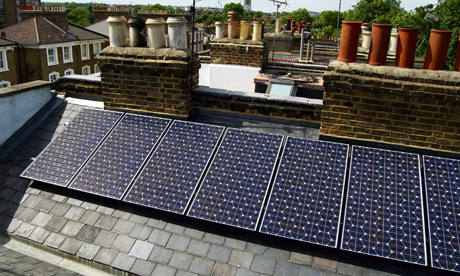 Roof-mounted solar PV is a renewable energy source highly suited to urban residential areas such as Hackney because it requires a relatively small amount of space. 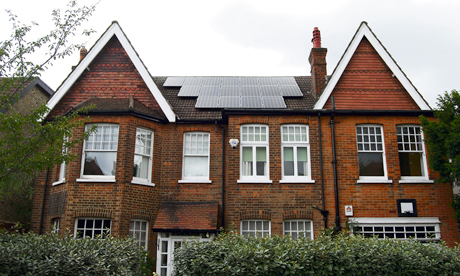 The feed-in-tariff (FiT) scheme announced by the government in April 2010 has made domestic renewable energy projects a lucrative endeavour (over the long-term) for homeowners. Under the scheme, it is now compulsory for major energy suppliers to purchase electricity from people generating their own renewable power. Therefore, anyone generating up to five megawatts (MW) of electricity is guaranteed a minimum payment for all electricity generated, a reduced energy bill and additional payments for unused electricity exported to the national grid. The tariffs are due to drop by nine per cent next April so to benefit from the starting rates of 41.3p per kilowatt hour (kWh) for 25 years you must have a system installed by a specialist before 31 March 2012. Installations after then will still benefit but from a reduced rate of 37.8p per kWh that will drop every subsequent year. Private homeowners, schools and businesses in Hackney have access to great local advice and installation companies passionate about energy efficiency. Athena Electrical (founded by Vivienne O’Brien, an electrician with over twenty years experience in Hackney) and JoJu Solar (Hackney-born and recently relocated to Islington) are two experienced and certified solar PV installation companies. According to Athena Electrical, a 2.2 kWh solar electricity system, costing around £12,000, can typically produce total savings and income of around £920 per year. Both JoJu Solar and Athena Electrical offer free quotes for their services. According to Michaels, the average turnaround from initial quote to the system coming online is about four to six weeks. 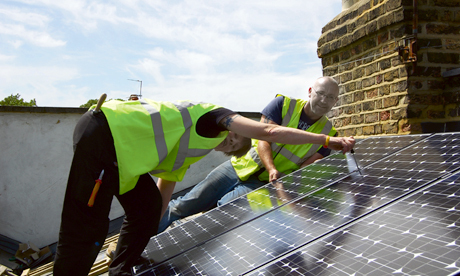 Martyn Williams, Hackney resident and senior parliamentary campaigner for environmental NGO Friends of the Earth, has had three renewable systems installed since 2002. He noticed that the process is becoming easier, “having done it three times over the last ten years you notice that systems are improved, costs are dropping and there is more competition amongst experienced installers”, said Williams. Williams sees the use of solar powered energy in the home as a viable investment. “Instead of putting out savings into a pension fund we put it into our roof, and we’re getting a better return on it, “ he said. Williams had his latest solar PV panels installed by JoJu Solar who are partnering with Friends of the Earth this year. JoJu Solar will be donating £140 to the NGO for every system they install, customers should quote “Friends of the Earth” to ensure the donation happens. There are some obstacles to be aware of. Firstly there is the issue of finance and initial capital investment. According to Athena Electrical’s Sylvia Haller, the vast majority of their clients have so far been private, relatively well-off homeowners with the cash to spend. The average domestic solar PV system will cost around £10,000-12,000 to install. Green loans are available through the likes of Triodos Bank, an environmentally conscious “sustainable” bank. And the Government is expected to launch the New Green Deal, enabling private firms to offer consumers energy efficiency improvements, such as better insulation, to their homes, community spaces and businesses at no upfront cost, and to recoup payments through a charge in installments on the energy bill. Planning permission is needed for listed buildings or homes within conservation areas. De Beauvoir resident Robert Cohen came up against planning permission issues after installing £10,000 worth of solar panels on his roof. Cohen’s original planning permission for a solar thermal system was contested last year by neighbours complaining about the solar PV panels he ended up installing when a thermal system became unviable. The Planning Inspectorate rejected appeals in March 2011, noting that the benefits outweighed any of the visual downfalls. Cohen gave this advice to anyone thinking about installing a renewable system in their home: “With solar PV, you do need to watch out for overshading from TV aerials or chimney pots, as these can reduce performance more than might be thought. “In our first year with our small (1.32 kWh) PV system, the PV provided 65 per cent of our total electricity use (on an annual basis). Be wary of rogue traders or uncertified installation companies. Systems without MSC (microgeneration certification scheme) licensing will not be eligible for the feed-in-tariff. According to a recent report, three-quarters of companies overestimated how much energy the solar PV panels would produce and most of them underestimated how long it would take for the system to pay for itself. There are also concerns about lack of information. At the moment, it is largely up to local community groups, individuals and private businesses to drive efforts to green up Hackney’s domestic sphere, but fortunately the borough has many residents who are committed to doing so.